CaptainDuckDuck has built-in support for several popular apps that can be deployed as is. 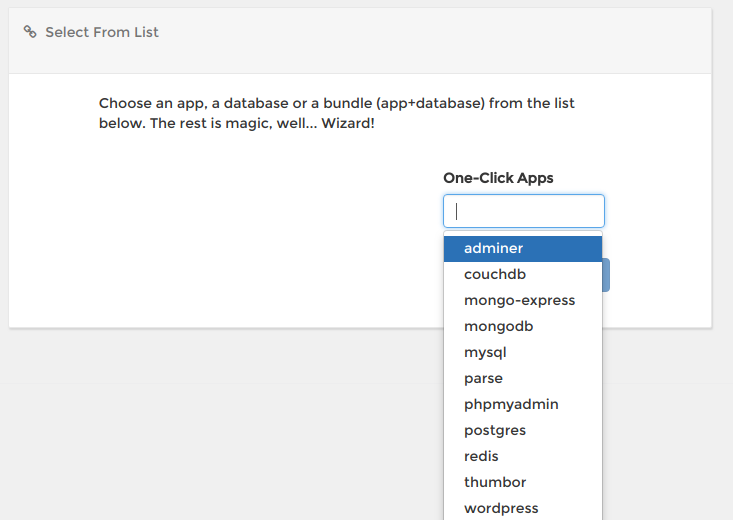 These include WordPress, MySQL, MongoDB and etc. They all come with pre-configured settings, however, you'll be have the option to customize the settings. For example, MySQL database uses port 3306, but you can change this port to another port if it suits your needs. It is important to mention that some of these configuration parameters, might show up as environmental variables in your app settings after you deploy the app, however, their values only being used in the installing phase. i.e., changing password of MySQL through changing the PASSWORD environmental variable will not work. Instead, you should use MySQL commands to change the password. The PASSWORD environmental variable is being used to set up the original password during the installation phase. Note that since all these applications are Docker containers, you can have multiple MySQL databases on running on port 3306 without having any conflict. If you want to connect to two different MySQL databases, from a PHP app, where both PHP and MySQLs are under the same instance of CaptainDuckDuck, you can use srv-captain--mysqlappname1:3306 and srv-captain--mysqlappname2:3306. Port mapping is needed if you want to connect to a database from a remote machine. You can read more about it Captain Configuration - Port Mapping.